A list of local warming centers and shelters can be found at: www.urbanaillinois.us/winterservices. If you begin to feel anxious, lonely or in need of support while you shelter in place during extreme weather events, call the free 24-hour Disaster Distress Helpline at 1-800-985-5990 (a resource of the Substance Abuse and Mental Health Services Administration). Frostbitten skin will become red and swollen and feel like it's on fire. You may develop blisters. Don't break the blisters. It could cause scarring and infection. Call your neighbors. Check to see that your neighbors are okay, particularly seniors, disabled persons or others living alone. 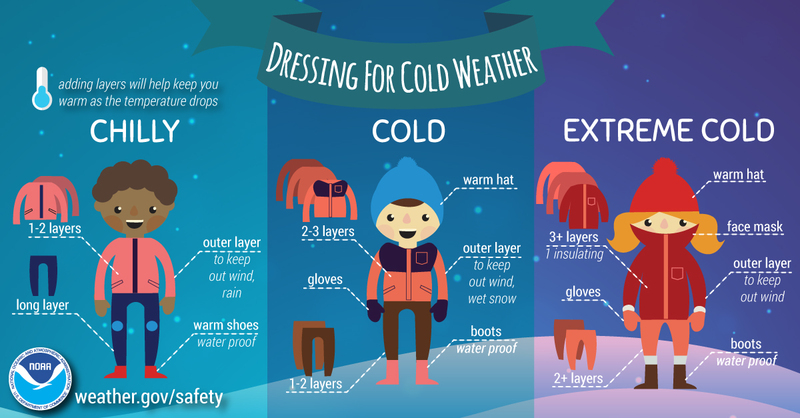 For more tips on staying safe during cold weather for older adults, visit the National Institutes of Health's page on Cold Weather Safety for Older Adults. If you suspect hypothermia is occuring, seek medical attention immediately. Call an ambulance. Move the victim inside to a heated location and begin warming the center of the body first. If the person is unconscious, administer CPR. Then lie close to the person and cover both of you with thick blankets. The hotter you get, the more warmth you can give the other person. Don't rub the person or handle them roughly. Let the cold water drip from the faucet served by exposed pipes. Running water through the pipe - even at a trickle - helps prevent pipes from freezing. Water pipes on exterior walls and in places that are subject to cold, like in the basement, attic, and under kitchen cabinets, freeze most often. Water expands as it freezes, causing pipes to burst. If they are frozen, first turn on the faucet. Water will drip as you warm the pipes. Heat the pipes using a space heater, heating pad, electric hair dryer, or hot water on a cloth. Never use an open flame. Continue until water pressure returns to normal or call a plumber if you have more issues. Do not use a blowtorch, kerosene or propane heater, charcoal stove, or other open flame device. For more tips on home safety during winter weather, visit the American Red Cross. Make sure your car or vehicle has at least a half a tank of gas during extreme cold situations so that you can stay warm if you become stranded. Update your winter car survival kit; make sure it has non-perishable food like energy bars, as well as bottled water, cat litter or sand for better tire traction, extra clothes, a shovel, first aid kit, and blankets. For additional winter car survival tips, visit: www.weather.gov/safety/cold-before. 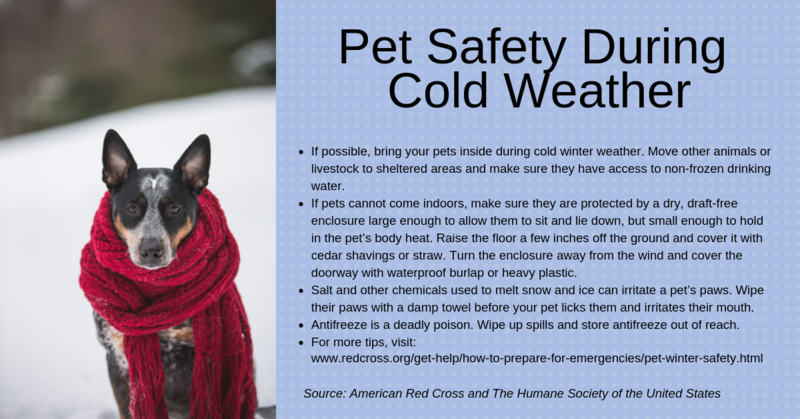 For more tips on cold weather safety, visit: www.weather.gov/safety/cold.